Now an HBO original series, True Blood-the New York Times bestselling Sookie Stackhouse series continues. Except for Sookie Stackhouse, folks in Bon Temps, Louisiana, know little about vamps-and nothing about weres. Until now. The weres and shifters have finally decided to reveal their existence to the ordinary world. At first all goes well. Then the mutilated body of a were-panther is found near the bar where Sookie works-and she feels compelled to discover who, human or otherwise, did it. But there's a far greater danger threatening Bon Temps. A race of unhuman beings-older, more powerful, and more secretive than vampires or werewolves-is preparing for war. And Sookie finds herself an all-too human pawn in their battle. 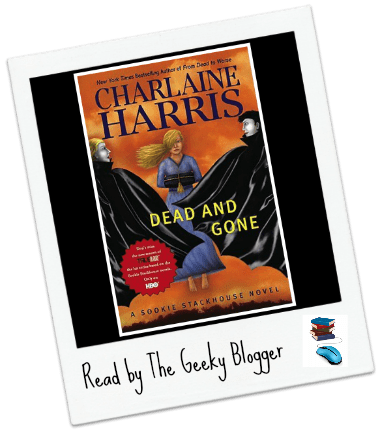 I loved Dead and Gone by Charlaine Harris. Mostly because it involves the Weres quite a bit (some of my favorite characters) and because it evolves Sookie’s relationship with what I feel is the right Vampire for her.